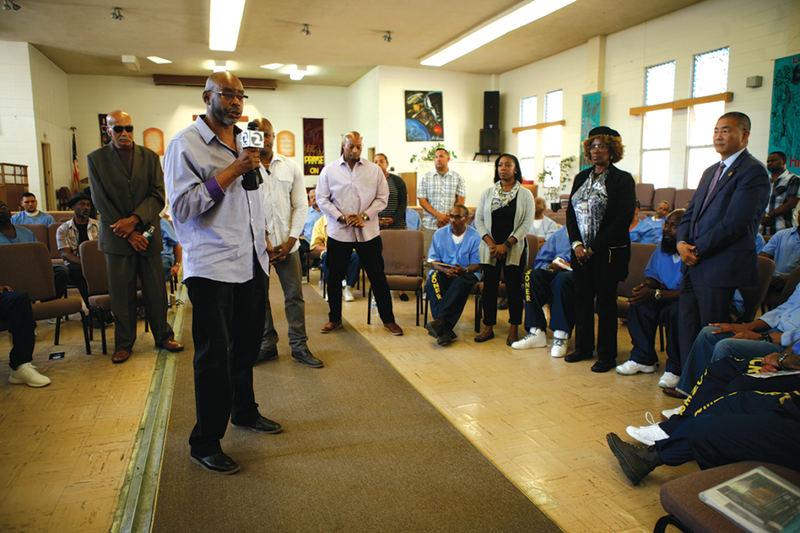 Law enforcement personnel and incarcerated men met in San Quentin’s Protestant Chapel on Sept. 21 for a first-of-its-kind forum. The idea came from the 2009 New Year’s Eve killing of Oscar Grant by a BART police officer. “They didn’t have Oscar Grant in mind; they had other kinds of grants on their minds,” Bryson said regarding people and organizations seeking to take advantage of Grant’s death. Seeking a solution to the cankerous relationship between the police and community, Bryson sought people he knew in the police department—the first person was Lt. Bobby Hookfin. They built a level of trust. Then Captain Michael Carroll got involved. Carroll wanted to do something about people of color committing crimes and ending up in prison. But he needed help. Two years ago, KTVU Channel-2 reporter Paul Chambers aired the first Barbershop Dialogue. Since then, seven San Francisco Bay Area cities, as well as Santa Rita Jail and two juvenile facilities, have held forums. 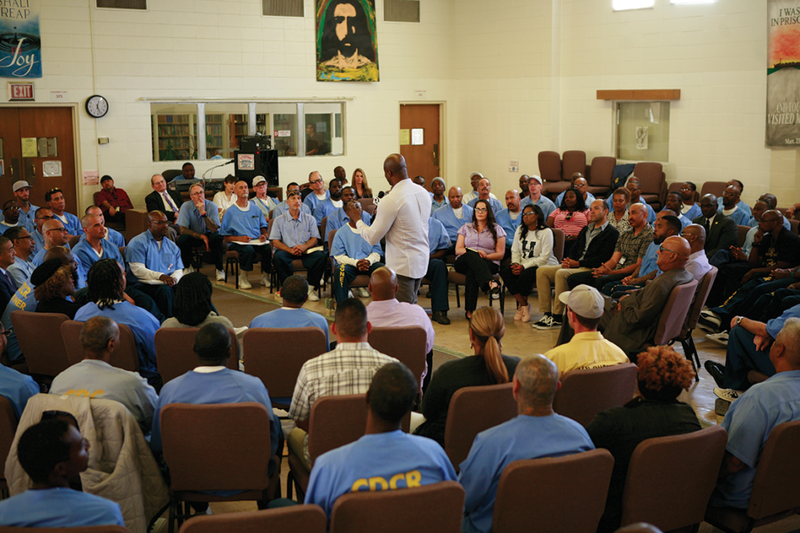 San Quentin’s forum had an audience of more than 100 inmates, about a dozen formerly incarcerated men and women, as well as several district attorneys and police officers. Bryson began the dialogue by giving an emotional testimony as he named people murdered in Oakland—not by police officers. He was troubled that the only time there was outrage was when the police killed someone. “Why is that?” he questioned. “I think that it’s important to have this conversation to move things forward,” Bryson said, regarding senseless killings in the community. Several formerly incarcerated people gave their reasons for participating in the dialogue. Darris Young, incarcerated 26 years, spent 10 years at San Quentin. He joined the Barbershop Dialogue to “bring some respect and clarity” to the conversation. “I thought that it was inconceivable at first, but these people had a great amount of respect for me, because I had respect for myself,” Young said, referring to law enforcement personnel. “The young folks need our guidance,” he added. Seventy four-year-old Glenn Bailey spent 52 years of his life incarcerated— more than a decade in San Quentin. Bailey released from prison in 2014, now spends Sunday evenings re- turning to San Quentin as a volunteer, mentoring lifers in how to present themselves to the parole board. Bailey, however, admitted, “I was in the room for about an hour before I knew that I was in with law enforcement.” Chuckles followed the comment. Trina Burton was incarcerated for 10 years . Lewis said he recalled going to family visits, between the ages of five and nine, to see his incarcerated mother. He said that his daughter is “caught up in the criminal justice system.” She is charged with the same crime as her father and is facing 25 years to life. Lewis is serving a sentence of 209 to life for assault with a deadly weapon. “It’s not a mistake that we made to come to prison. We broke the law,” Richardson said. He added that the first step toward change is being accountable for your past actions. Jill Klinge, a 31-year veteran assistant district attorney from Alameda County, talked about the county’s restorative justice program—it uses formerly incarcerated people as mentors. She said she wants to have a better understanding of how self- help programs work in order to make informed parole recommendations. “In order to know about inmates you have to come in- side to prison to get to know the person for who they are,” said Monique Thomas, a volunteer in one of the self-help programs at San Quentin. Her overall message was to get into programs and stay hopeful. Carroll brought up the Santa Rita Juvenile Youth Opportunity. The idea is to give youngsters a “real” experience of what it’s like inside of a jail. He said the program’s challenge is get- ting more children of color involved. Chambers said positive contacts with law enforcement take away some of the stereotypical stigmas that young people of color have developed over generations. Bryson said last year, the Richmond forum had the biggest impact. The results after two years of the Barbershop Dialogue—27 people from Bay Area counties have applied to police academies, with eight patrolling the streets.